Traditional Crocs were either loved or hated, but the shoe label has come a long way from those colorful clogs and their 2013 Spring Summer collection is just a demonstration just how far the styles have evolved over the years. 2013 Spring Summer collection is not only different, but also fashionable and features a number of stylish designs, and best of all, the new silhouettes have not lost any of the comfort that the original clogs were known for. Crocs has several different model lines: Retro, Boat shoes, Huaraches, which always reminds us of the Beach Boys song Surfin’ in the U.S.A., but these huaraches have nothing in common with those surfer ‘60s sandals that had leather uppers and tire-tread soles and there’s a line that is also more feminine with pretty flats and great looking wedges. The top of the line of the collection is the women’s beach line boat shoe. These shoes are so lightweight that they actually float and come in five vibrant colors, with sport siped rubber pods on the outsole for better grip and traction and decorative laces. 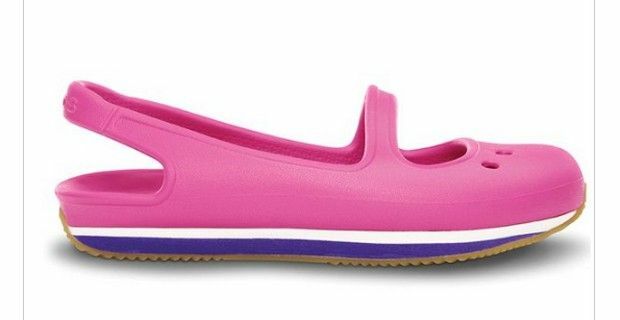 The Crocs Retro collection is a 70s era inspired running shoes, and are reinterpretation of the classic model. You'll can find Mary Janes, flat sling backs and flip wedges, that are in charming bi-colors and all feature the Croslite™ material for lightweight cushioning, which is soft, non-marking and odor resistant. The Retro Collection is available for men, women and children. Thanks to an innovative technique, Crocs has created a line of huaraches with colorful translucent straps that are inspired by the original Mexican hand woven huarache and are also available in a flip flop and wedge styles. For a very up-to-date look check out the Kadee Leopard flat shoe with distinctive heel windows and detailing, that features circulation nubs along the footbed for a massage-like feel. Prices range from £24,99 to £59,99 for the leather or linen cork wedges.